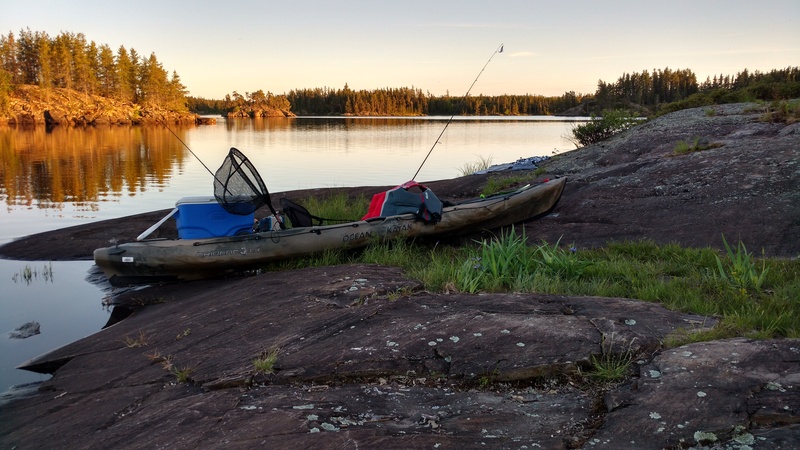 It was looking to be a beautiful week as we headed out early Tuesday morning into Nopiming Provincial Park and made our way to the Seagrim Lake Canoe Route. Mid-20’s and sunny, just the way I like it. A friend of mine (Lyndon) had recently bought a canoe. He was eager to try out some camping with it with my cousin Garry and I. Naturally this was the perfect opportunity to do the same with my kayak. It was an easy decision to book the time off. 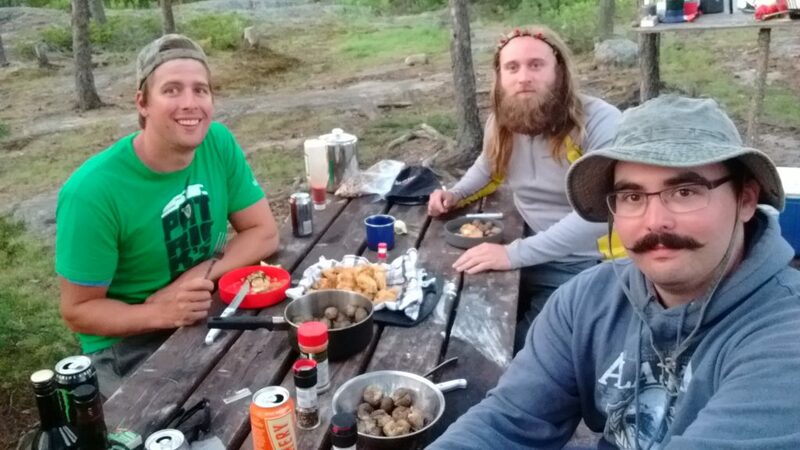 They were new to canoes and paddling, and left the route planning to me while they took care of the food. I had never done any real portages nor any camping yet with my kayak. Therefore I wanted a route that would give us minimal portaging and a relatively beginner level of paddling. I also wanted lots of open water to fish on. The Seagrim Lake chain met all those requirements perfectly. The Seagrim Lake chain is a series of two small lakes followed by two larger lakes, with small portages of between 100-300 meters. The first two lakes are unnamed and the two larger ones are Elton Lake and of course Seagrim Lake from which the route takes it’s name. I had done a little asking around and found that the fishing on Elton would likely be better for us than on Seagrim. We decided to find a campsite there rather than going the whole way in. 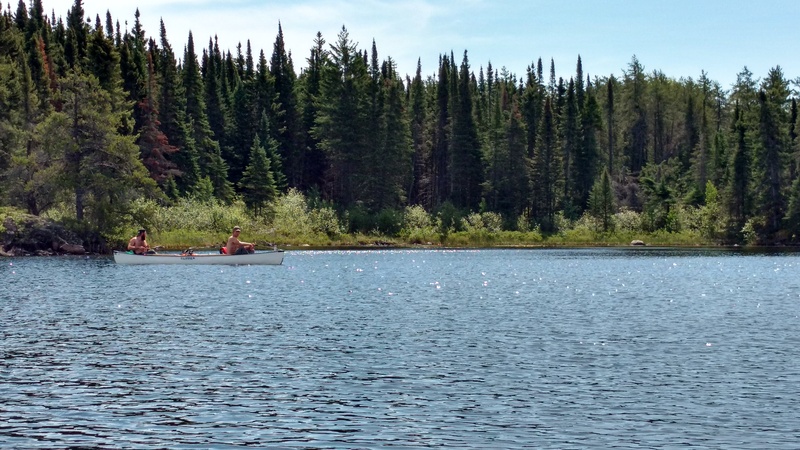 The first portage was from the parking lot to the first lake. This turned out to be a great setup, rather than being able to park near the water. This first portage let us as beginners get a feel for what would be involved in dragging/carrying our boats with us. For myself I learned after about 100 meters that I would not be dragging everything together in one go. It would be much smarter to drag the kayak and my heavy cooler separately over 2 trips. 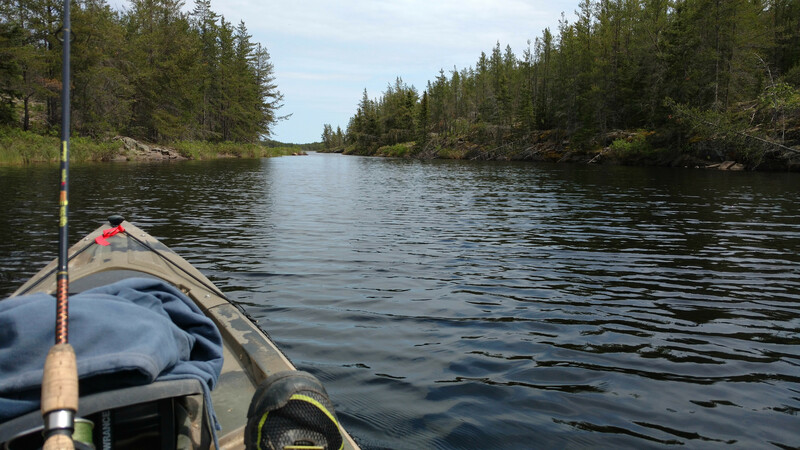 The lake was tiny, and a quick paddle across to the next portage. This one was a little longer and a little harder, involving a lot of up and down over rock slopes. We finished it in short order and came out onto the second lake. 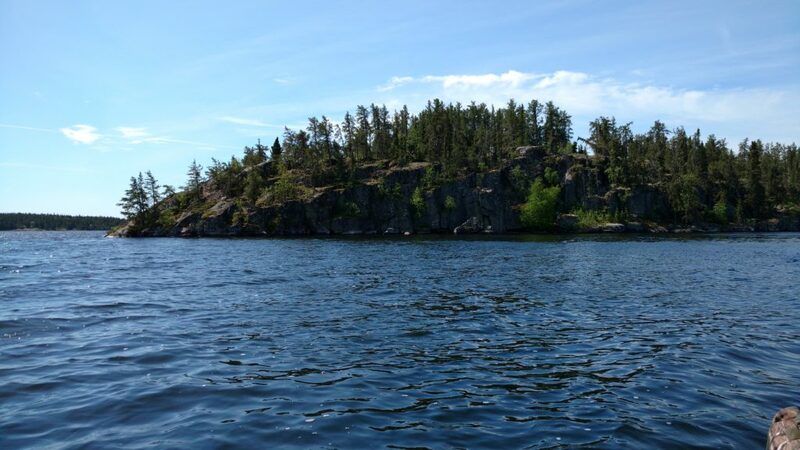 This second unnamed lake had remarkably clear water and some beautiful rock cliffs along the nearby shores. 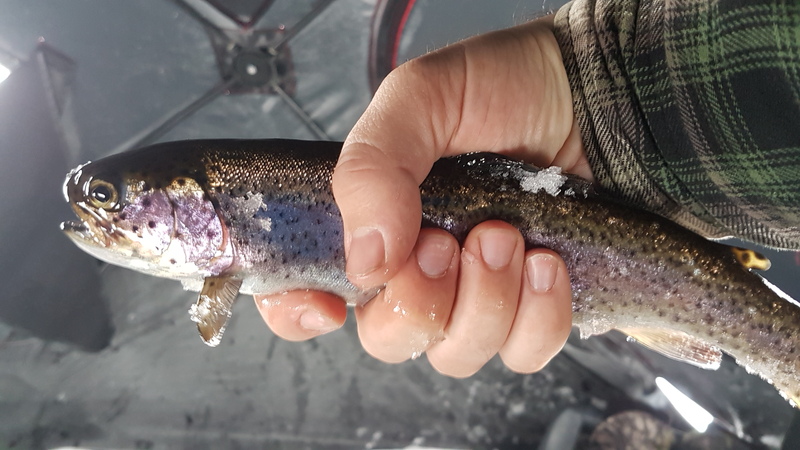 we decided to fish this lake for awhile before moving on, and although we didn’t catch anything we were rewarded with schools of thousands of minnows and young perch swimming along under our boats. It was really a great sight to behold especially with the clear water. After relaxing on this lake for awhile we headed to the final portage into Elton Lake. This one was fairly short and straight forward and in no time we were looking out on a long channel leading to the main body of the lake. Elton Lake has a few designated camp sites and they are all very nice. 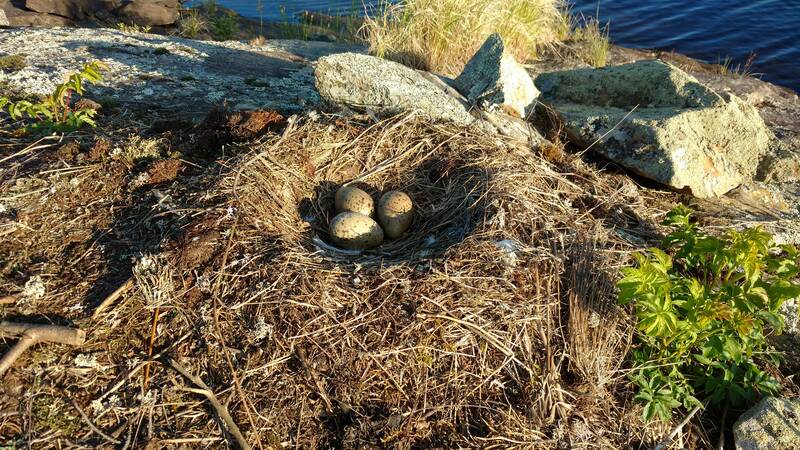 We chose one on an island with some height which gave us a fantastic view of the lake. Our site had a heavy duty picnic table, a grated fire pit, a backwoods toilet, and a second table made of plywood which made for an excellent kitchen area. As far as what I’ve been used to for backwoods sites, this was the pinnacle of luxury! We set up camp quickly and got down to some serious fishing. 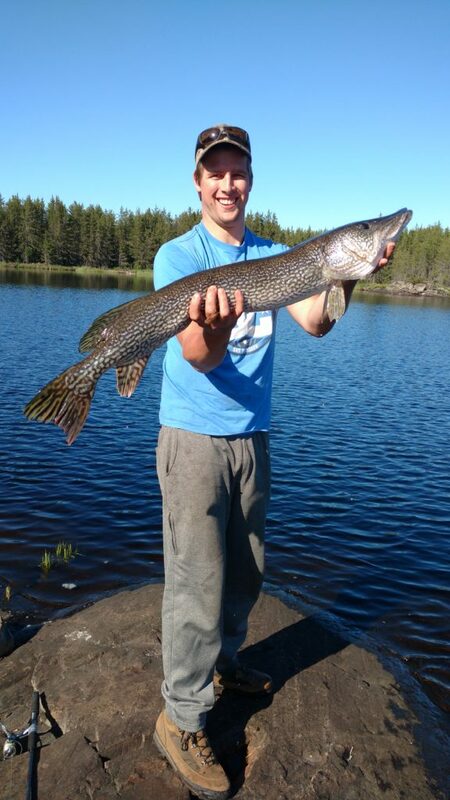 Several pike and a couple walleye were the haul for the evening. Not enough for eating, so we threw them in the cooler and settled for some steaks instead. Relaxing by the fire for the evening, it didn’t take long for the sun, fresh air and paddling efforts to hit us, and we crashed early. Wednesday morning brought an early rise, bacon and eggs for breakfast, and a full day of fishing. We explored to the opposite side of the lake from the campsite. 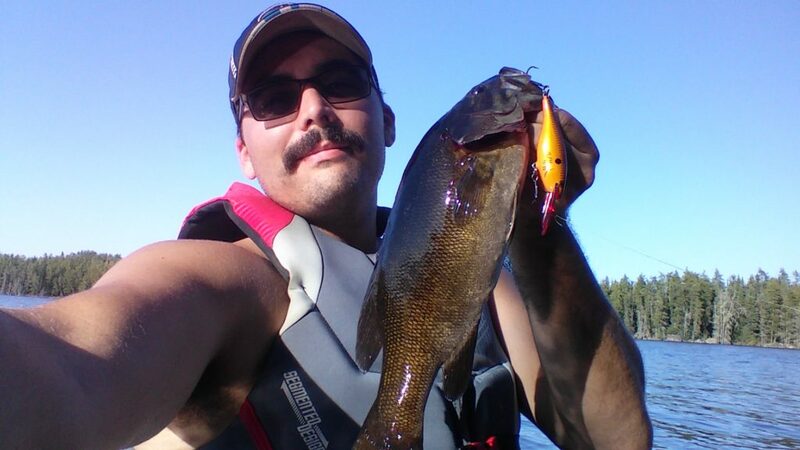 We caught a variety of pike, bass, and walleye, including a master angler smallmouth bass for myself. One of the highlights of the day was a big lazy pike slowly cruising back and forth along the shore near our campsite. He was there every now and then when we would go down to shore to wash dishes or cast a line. I dropped a line down at my feet and watched him take it, then lazily try and swim away with it. He didn’t seem to care all that much that I was trying to pull him in and he just came easily without fighting at all. To top it all off, once I let him go he just kept cruising the shoreline. A couple hours later even Garry dropped in a line at his feet and pulled the pike in again. We decided for the sake of competition that it probably shouldn’t count towards our total if we just keep pulling in the same fish over and over without a fight. We had enough fish for a good fish fry dinner. Coupled with baby potatoes straight over the fire it made for a satisfying end to the day. Thursday brought our final day, and of course another bacon and eggs breakfast. 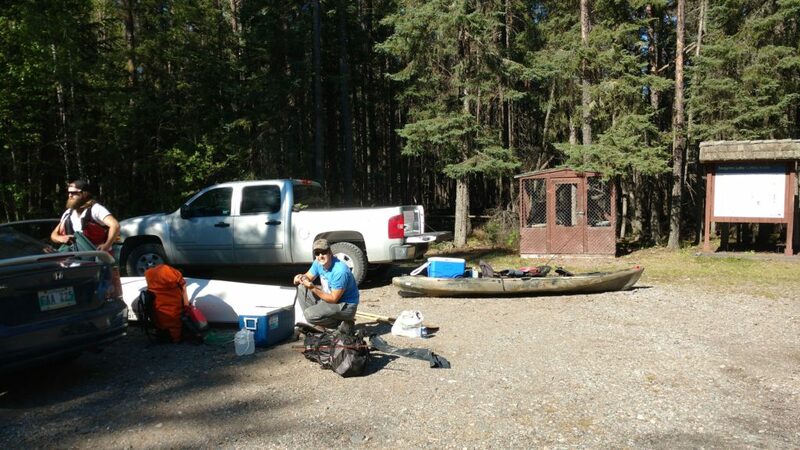 We packed up camp and loaded all our gear onto the boats, with the plan of heading out to the parking lot quickly and hitting one of the other nearby lakes in the park before making the drive home. Of course we stopped and fished along they way, without much luck. 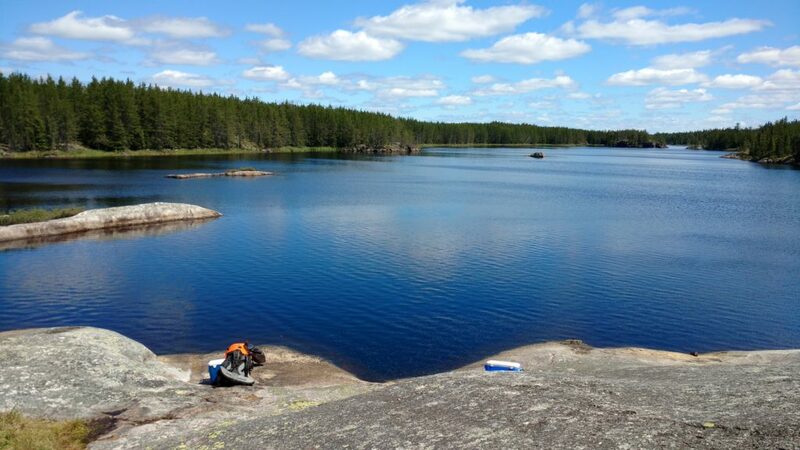 Again enjoying the clear water of the second lake and the schools of thousands of bait fish swimming under us. We got back to the parking lot, packed up and hit another small lake up the road. It was nice enough but we only hung around there for an hour or so before the rain clouds started coming in. We packed up quickly and headed home just as the rain hit. It was a fantastic trip overall. 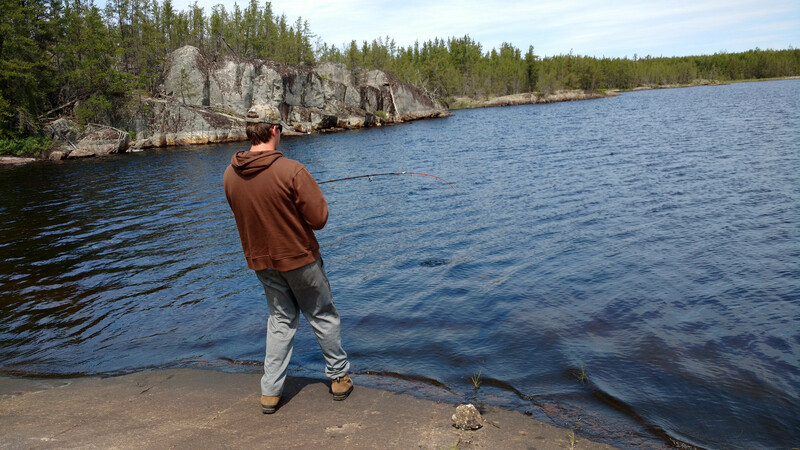 Our site was beautiful, the weather was great, and the fishing was decent enough to make a good meal. 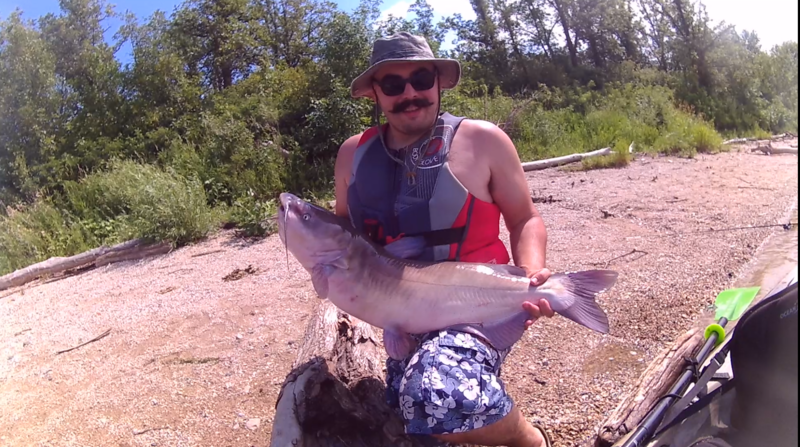 I got a master angler bass to submit, enjoyed a variety of wildlife, and we explored a new and exciting area of the wilderness that I hadn’t been to yet. Nopiming park is full of hidden treasures, and this is one I’ll be sure to visit again. 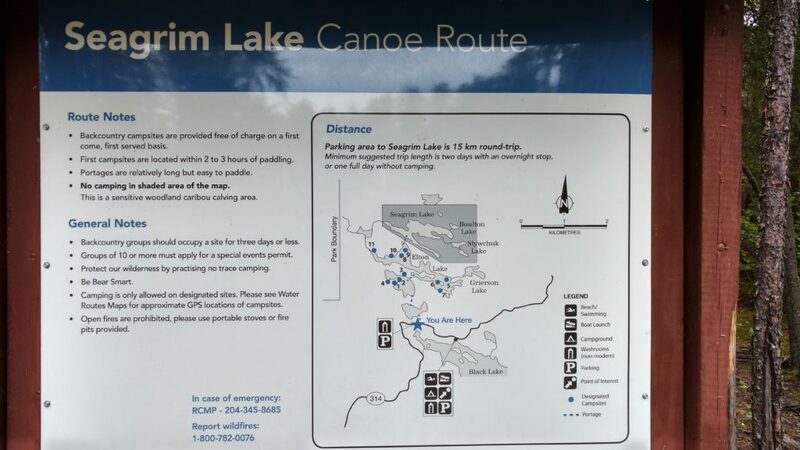 The Seagrim Lake Chain is a fantastic experience for both beginners and experts alike.